• Highly data-driven companies are three times more likely to report significant improvement in making big decisions, but only 1 in 3 executives say their organisation is highly data-driven. The great majority of executives around the world – 94% – say management of their company is prepared to make significant decisions about the strategic direction of their business, but barely one-third relied primarily on data and analytics when they made their last big decision. Executives' intuition or experience and the advice and experience of others in their organisation were the decision making modes of choice for 58% of executives. However, of the executives from highly data-driven companies, 43% report significant improvements in decision making over the last two years. All executives said top priority over the next two years is to make investments in the quality of data analysis to make better decisions. 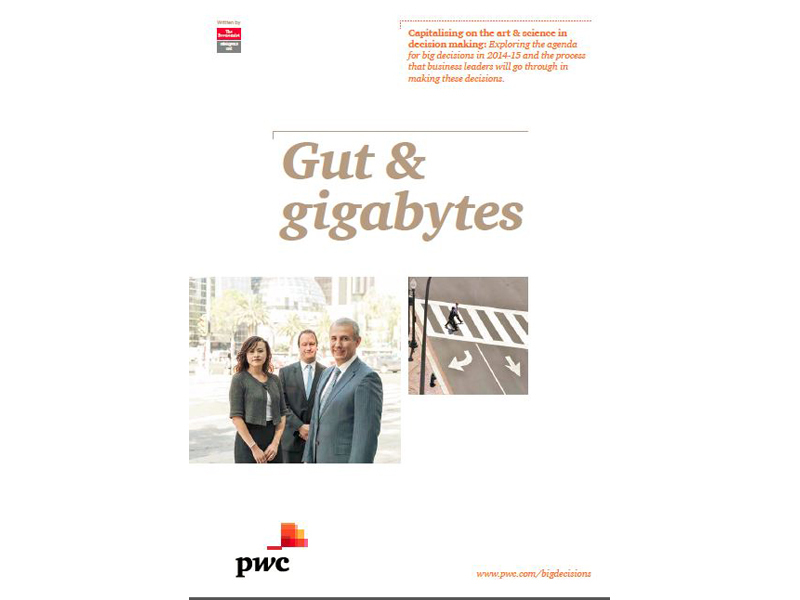 According to Gut & gigabytes: Capitalising on the art & science in decision making, a new survey report by the Economist Intelligence Unit sponsored by PwC, executives make big decisions frequently and review them often. More than three-fourths of executives make a big decision each quarter and 43% review them every month. The survey found that the five most important decisions facing executives in the next 12 months are, in order: growing the existing business, collaborating with competitors, shrinking the existing business, entering a new industry or starting a new business, and corporate financing. "A company's success today is tied to how good it is at making big decisions. While executives say they continue to rely on experience, advice, or their own gut instinct, they also see investment in data and analytics as critical to success. 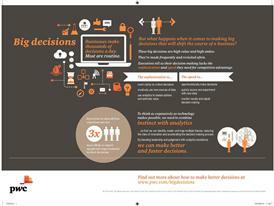 Experience and intuition and the use of data and analytics are not mutually exclusive. The challenge for business is how best to marry the two. Executives know the right questions to ask. Now they need to know how to get the right answers from external and internal data they've used over the last two years." Executives said the appearance of a business opportunity they could not ignore was the most common motivation for considering a big decision (30%). Other reasons: making decisions that were previously delayed (25%), strategic fit (18%), testing ideas (15%), reacting to external factors (9%), and regulation (4%). Despite executives' comfort in relying on gut instinct, nearly two-thirds (64%) said the use of data has changed how their company makes decisions and they expect it to have more impact in the future. The top three changes executives plan in decision making include the number of people involved in making a decision, greater use of specialised and enhanced analytics and data analysis, and the use of dedicated data teams to inform strategic decisions. "With so much at stake when it comes to the impact of big decisions on profitability, often valued in the billions of dollars, and the lack of predictability and frequency of when decisions are required, companies are trying to increase their decision making speed and sophistication. Better decision making requires the use of newly accessible data and analytic techniques, as well as clarifying accountability and the decision making processes." 1. 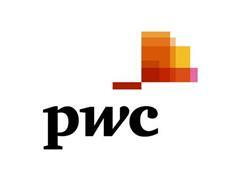 The EIU in May 2014 surveyed 1,135 executives, of whom 54% were C-level executives or board members. 2. Respondents came from Europe (29%), North America (35%), and Asia-Pacific (24%). The remainder were from Latin America, the Middle East and Africa. 3. Eighteen industries are represented; about 10% each from banking and capital markets, technology, energy and utilities and mining. 4. 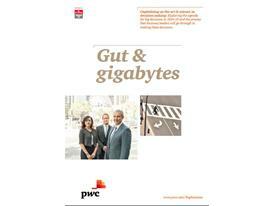 The majority of companies reported annual revenues last year of at least US$1 billion.